Wymondham is a village near Melton Mowbray in the county of Leicestershire in the East Midlands of England. We have a windmill which is a popular visitor attraction, and a pub with a fine restaurant. The village also has a primary school and a post office with shop. The rest of this site offers a comprehensive collection of photos and sketches plus history, including the village's connection with early Stilton Cheese production. Those missing Burdall's Gravy Salt should join the discussion in the Message Forum. 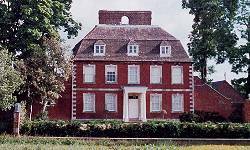 If you are looking for the other Wymondham, we have maps and suggest you see the Wymondham-Norfolk site. 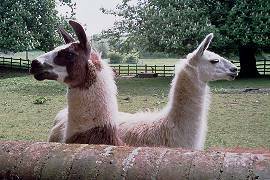 Mr Peru and Lopez are llamas belonging to Hetty Williams. Occasionally they escape for a trot around the village. To set up or access your free Web-based email account, follow the link to http://wymondham.zzn.com Further details are on the mail service page. Enjoy your visit to Wymondham!